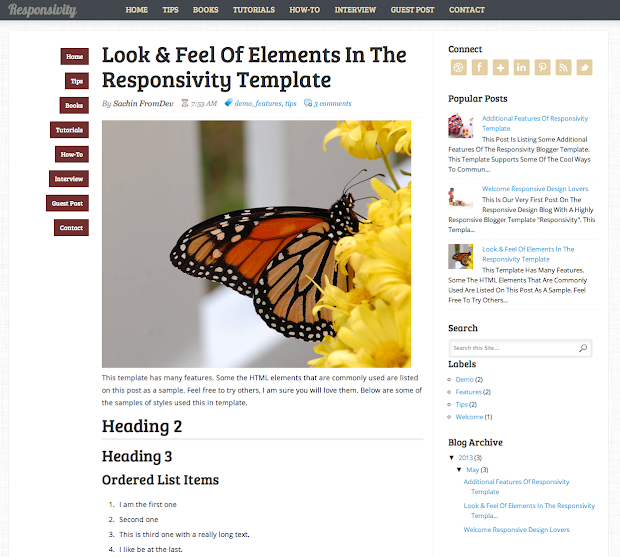 Responsivity is a responsive blogger template that is created using jQuery plugins and a lot of inspiration around the web for responsive design. There are hundreds of blogger/blogspot templates floating around on the web however none of them are solving the current responsive needs. Most of them have fixed width and size that does not really utilize the full potential of a fantastic resolution on a high quality monitor. At the same time they are too cumbersome for small screen devices like mobile and tablet. Responsivity is a adaptive template that uses smart jQuery plugins to adjust itself for the target screen resolution and size. Blogger is one of the most popular blogging platform after wordpress. Blogger is completely free with absolutely no expense required. Its fast to setup and the site performance is also really great. This site fromdev.com is also powered by it. Therefore we designed this theme to be able to use on some of our future sites. We would love to share this with all of our subscribers and would like to hear feedback about it. 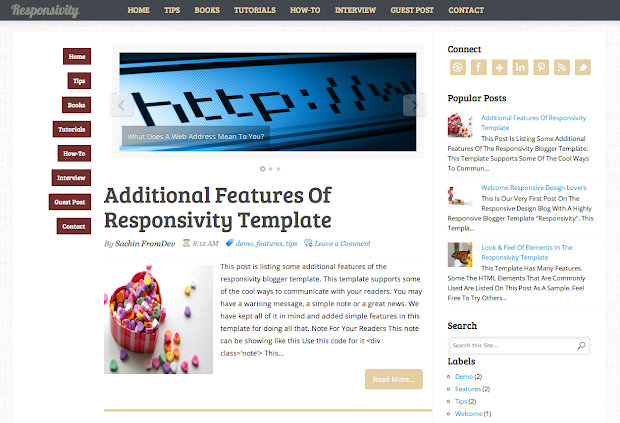 This powerful blogger theme comes with a lot of cool features. Just to list down a few. The Responsivity template is available totally free for the Members of our exclusive resource page. To become a exclusively member, simply add your Email in the form below and subscribe to our updates via Email. As soon as you click sign up we will send you a confirmation Email, click the confirmation link and below it you will see the link to your exclusive Resource Page with a password. In that page you can download the template. Click the Browse button and locate Responsivity template (its a xml file inside the zip). The template supports a lot of features. Do not forget to checkout the look and feel of the elements of the template, and some extra features. So what are you waiting for, create a new blog or revamp your current blog with this totally new template and surprise your readers. Don't forget to share your feedback with us.